'The Jakkat Mahal and Bridge City of Poonah [Pune]. 9th October 1871'. bl.uk > Online Gallery Home	> Online exhibitions	> Asia, Pacific and Africa Collections	> 'The Jakkat Mahal and Bridge City of Poonah [Pune]. 9th October 1871'. 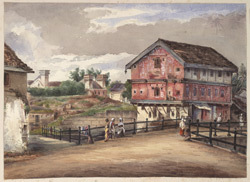 Water-colour painting of a view in Pune (Poona) by John Frederick Lester (1825-1915) dated 9th October 1871. This image is from an album of water-colours made between 1865 and 1877 in Kathiawar, Bombay, Poona, Mahabaleshwar and Savantvadi State. Pune is situated near to the Western Ghats in Maharashtra at the confluence of the Mutha and Mula rivers. The city prospered during the early medieval period, largely due to its strategic position on trade routes between the Deccan and the Arabian Sea. Pune later became the capital of the Marathas in the 16th century until they were deposed by the Brahmin Peshwa family. The Peshwas subsequently ruled Maharashtra for more than a century until 1818. They were renowned patrons of the arts and in their time enriched the city with temples, gardens and educational institutions.